No matter the size of the productions, we have you covered! Spectrum Audio Visual has provided audiovisual services to all of Denver’s	venues, as well as large venues throughout the U.S. Our team travels regularly	from coast-to-coast to provide high-level presentations. Our expert consultants	use their extensive experience to analyze your needs and customize equipment	to create professional, hassle-free presentations. 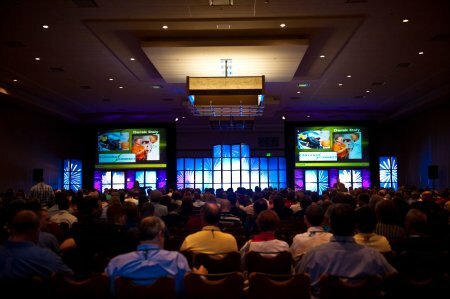 For staging and production	you can trust to optimize your event, call Spectrum Audio Visual today. Whatever your need—from smaller, more intimate productions to an	event for several thousand attendees—Spectrum Audio Visual has you covered. Experience in providing video image magnification (IMAG) for groups of	100 to several thousand using live, multi-camera video production with	graphic support capabilities. Spectrum Audio Visual offers a full range of video production services	and audio visual services. Our experienced staff is ready to guide you	through the process and make sure you’re getting exactly what you	need to pull off the perfect event with the least amount of stress possible. We work with the top equipment manufacturers to get the best tools to	match your needs, and our staff will make sure your stage lighting is	directed precisely where it needs to be. No dropping off equipment and	letting you figure it out; we’ll set up everything and make sure	it’s what you are looking for. Choose Spectrum Audio Visual for	all your event production needs. For the best in event staging, call (303) 477-4456 today!